FUE’s Feb 2019 Playlist is LIVE! & Flyy Guy’s Official Playlist – Who is Flyy Guy Fresh? Who is Flyy Guy Fresh? Flyy Union Entertainment has started curating monthly playlists of the Hottest Hip-Hop & R&B songs from the dopest signed & unsigned artists on Apple Music & Spotify. If you know anyone that may be interested in submitting to the playlist have them follow the FUE instagram page @Fue.Live & direct message or email FUEplaylistsubmissions@gmail.com. Stream & add the playlist FUE’s playlist below. Flyy Guy Fresh has decide to share with his fan and supporters! He has curated a playlist of the songs he’s vibing with for all the supporters out there that want to know what Flyy Guy may be listening to. Discover some of the Hottest songs from the dopest signed & unsigned artists on Apple Music & Spotify. Stream & add the Flyy Guy Fresh’s playlists below. lyy Guy Fresh is a Harlem upstart – by way of the Bronx – who defines his music as such: Harlem. A few years ago, Flyy Guy decided to take his craft seriously, and since making that commitment, he has released a series of studio albums and singles that have earned him a true, and ever growing following. If there were a visual depiction of what “hustle” is, it would be a picture of Flyy Guy. Since the release of “Dough Out” in April 2017, Flyy Guy followed up with two singles that broke over 5K streams on Spotify in a short period of time. But it was his single in the first quarter of 2018 that gained the attention of Power 105’s DJ Will, who spun Flyy Guy’s record, “100 Karats” on-air. This opened even more doors for the rising artist. From satellite radio picking up the single, to royalty checks, abundance started to flow easier. This past Summer (2018), Flyy Guy’s single “Down to Ride,” produced by DLo Beatz, is on pace to being his highest streamed single to date. The only direction left to go from here, is up. Consistency, growth and persistence makes Flyy Guy a new force to be reckoned with. 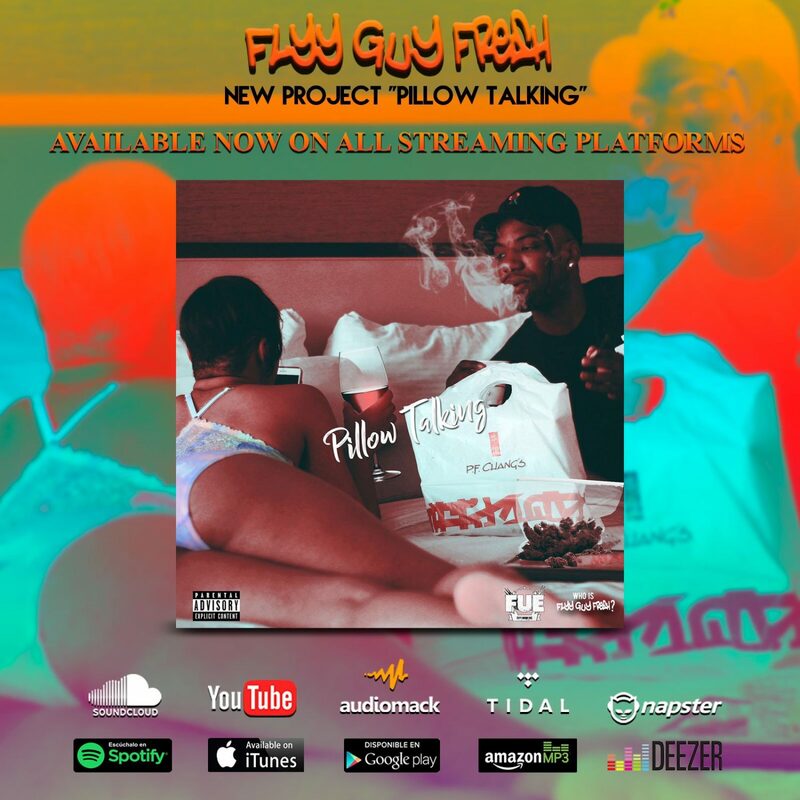 Next Flyy Guy Fresh’s New project “Pillow Talking” is OUT NOW!